Who's Afraid Of The Big, Bad, Wolf........Spider? 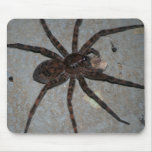 Wolf spiders are members of the family Lycosidae. There are more then 2000 species of wolf spiders, but they generally all share the same basic look. They are hairy, with stout bodies and long thick legs. Wolf spiders bodies range in size from about a 1/2 inch to 2 inches in length. They are a mix of brown, black and gray in color with various lines and patterns. Alright, so the wolf spider can be big, but the truth is they aren’t bad. Wolf spiders are very beneficial. In fact, wolf spiders are considered one of the most beneficial spiders when it comes to helping to maintain the populations of annoying garden and household insect pests, such as mosquitoes, aphides, flies, beetles, ants, locust and even other spiders. Wolf spiders are great moms! The female wolf spider attaches her egg sac to her body, this sac can be almost as large as her body. When the eggs hatch, she tears open the sac and the babies will ride around on her body for about a week, until they are old enough to hunt on their own. Wolf spiders are a non aggressive, in fact some people keep them as pets! However, they can and will bite if provoked, so I wouldn’t recommend just scoping one up or trying to cuddle with it. The bites are not poisonous to humans. Sadly these wonderful spiders are often killed simply because people mistake them for the dangerous brown recluse. I Love them! Some of my best friends are spiders. I am terrified of them! I will run away screaming if I think I see one. I don't mind them, if they stay out of my house. I don't even notice them. So how can you tell the difference between a wolf spider and a brown recluse? The easiest way is to look into their eyes. Wolf spiders have eight eyes in a very distinctive pattern. That looks like this. 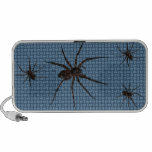 Now obviously, wolf spiders do not have bright yellow eyes, I used this color so the pattern could easily be seen. A row of four small eyes with two large eyes above those and two medium eyes above those. As far as spiders go, the wolf spider has excellent eyesight. Unlike most spider species, the wolf spider does not build a web, but hunts it’s prey on the ground. In this picture you see a wolf spider who is enjoying a moth he has captured. Their eye sight is essential for hunting and capturing prey as well as recognizing mates and rivals. Spider eyes have a layer of light reflecting crystals called tapetum. The majority of wolf spiders hunt at night, their four largest eyes have well developed tapetum which help them to easily spot the movement of prey in low light. This is also what cause them to reflect if you take their picture or happen to catch them in a flashlight. You can see a little eyeshine in the top picture of this page, from the flash from my camera. Where as brown recluse spiders only have six eyes in an eye pattern that looks something like this. What’s that you say…..you are not willing to get eye level with a spider? Oh, ok well there are a few other ways to tell the difference between the two species. The brown recluse is not hairy, it’s tan to golden brown in color and has a distinctive fiddle looking marking on its head. The fiddle is normally dark brown or black and often looks shiny. Their bodies are about 1/4 to 3/4 inches long and they have long crab like legs. So it really isn’t too hard to see the difference between the two species, if you just take a moment to look at them. Large, hairy, stout with eight eyes, it’s a wolf spider. Small body, not hairy, six eyes, long crab like legs and fiddle marking, it’s a brown recluse. Now I bet you looking at the pictures on this page and seeing just how cute the wolf spider is, hearing a bit about what an good and interesting species of spider they are and I bet you thinking to yourself. Hey, I’d like to have one as a pet. Here are some tips for keeping a wolf spider in captivity. They do not require a lot of space a 2.5 gallon aquarium will do, just make sure they have enough leg room. Cover the bottom with about 2 or 3 inches of potting soil. Add in some dry leaves, sticks, moss or pieces of bark for hiding under. Be sure to have a ventilated, escape proof lid. Wolf spiders are not very good climbers but they are very quick. Wolf spiders should be fed every other day for smaller species and every day for larger species. They will eat almost any living insect that is about ½ their own body length. However, it is best to stick to flies, crickets, moths, mealworms and caterpillars. Crickets and mealworms can usually be purchased at most pet stores. Feeding bees, wasps or other spiders can end up leaving your wolf spider injured. So its best to avoid them. The hunting wasp is always deadly to the wolf spider. 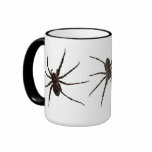 Wolf spiders do not require a lot of water. A dampened cotton ball is a good choice. Daily misting of the cage is also a good idea, wolf spiders prefer a humid environment, but don’t let the area become really wet. Room temperatures of 70 to 85 degrees. * Wolf spiders shed their skin. Juveniles will molt once a month, adults about once a year. The spider may lay on it’s back while molting, this is normal behavior. Wolf spiders will not eat during shedding and it’s best not to feed them for a few days after a shed because exoskeleton will be soft and easily punctured. Also remember: Never house spiders together. Don't handle your spiders. No, you say, you aren’t interested in having a pet wolf spider? But ok, maybe I have convinced you that may want to attract some to your garden. Here is a tip, some species of wolf spider like to hide out in burrows. Taking the handle of your garden shovel and pushing it in the dirt at an angle to create long tunnels may entice them to hang out in your garden and to protect your plants from pests. You still hate spiders, but you found a wolf spider in your house and after reading this you don’t have the heart to squash it. You really don’t want to squash it any ways, due to the large size it’s quite messy to clean up! Here is an easy way to remove spiders from your home. Cover them with a bowl or cup and gently slide a piece of paper or cardboard under the bottom. You can then safely take them outdoors and release them. Some books you might find interesting. They move really fast. They dont build webs. And theyre fierce hunters. Look inside to discover what's going on in the world of wolf spiders. Interesting article! I used to be terrified by spiders, but now see their benefits. Besides, they have a right to live, too! I don't exactly find them cuddly, but they get my respect! 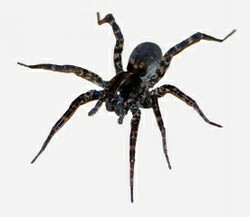 I seen a house that was infested with these spiders on TV. I have to admit to being a little nervous around spiders. Very interesting though!